U.S. equities put together a modest rebound on Wednesday, given that no new trade war news emerged. But that didn’t mean there weren’t movers. In that respect, let’s see what top stock trades we were able to sniff out for Thursday. There’s a lot to react to Wednesday, so let’s start with Starbucks Corporation (NASDAQ:SBUX). Long-time CEO Howard Schultz stepped down last year and then exited his role as executive chairman earlier this month. The company didn’t take long to make swift changes though. On Tuesday evening, it raised the dividend 20%, announced slower-than-expected growth and said it will close more underperforming stores than previously thought. On the surface, that doesn’t sound horrible. But that didn’t stop investors from bludgeoning the stock down almost 10% to new 52-week lows. 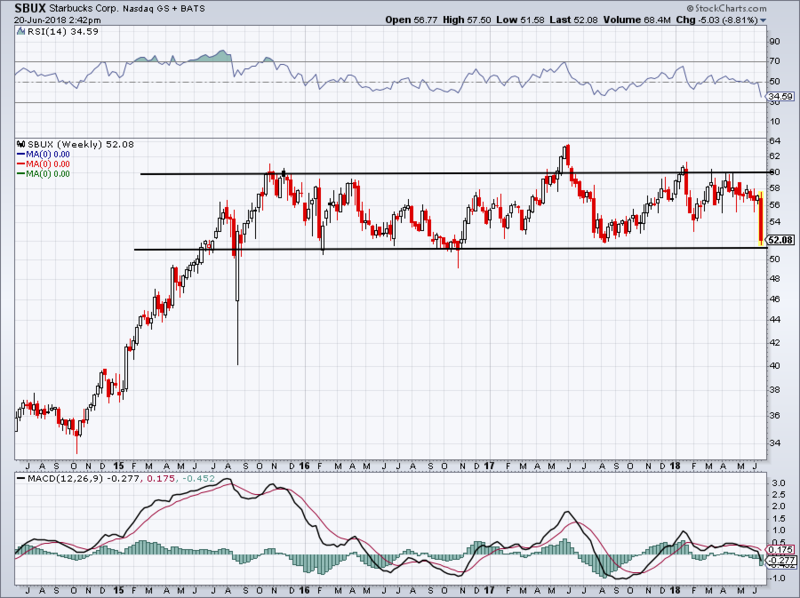 SBUX stock is at a really critical point. While $60 has kept a lid on Starbucks over the past three years, $51 has been support. Given that SBUX blew through $55 support and fell to this level in a day, bulls have a right to be nervous about it holding up. Should it break, SBUX could fall into no man’s land. And that’s a very real possibility if the market views the stock as transitioning from growth to value. General Electric Co (NYSE:GE) was dropped from the Dow Jones, leading to a roughly 1% drop in the stock. While it was able to hold off making new lows for a day, we’re talking about only a few pennies separating current prices and new lows from happening. We warned investors that once $15 failed, $14 was next and if $14 was breached, new lows were possible. Well, here we are. Only once in the decline did I feel there was a shot at buying GE and that was when it got above $15. That was a solid risk/reward setup because it allowed investors to bail with minimal losses if it didn’t pan out. Now down here, there’s no clear way to define our risk if the lows give way. I’d rather be in stocks that are working — like Salesforce.com, inc (NASDAQ:CRM), Box Inc (NYSE:BOX), Roku Inc (NYSE:ROKU) and FANG — than in a loser like GE. Does it bottom at $12.50? $12? $10? I don’t know. And I don’t want to own the stock while we find out. For GE to get dropped from the Dow, someone needed to be added and that someone is Walgreens Boots Alliance Inc (NASDAQ:WBA). After successfully seeing $62.50 hold as support, I’d love to see WBA push above $68 this week and hold that level as support. From there, it can challenge resistance near $72.50 to $75. It will likely need some time to make that happen, but if it push through, its prior highs near $92 are back on the table for an eventual retest. If the $68 level holds as resistance, see if WBA stock finds support near $65, the backside of its smaller trend-line of resistance (blue line). While FedEx Corporation (NYSE:FDX) beat on earnings per share and revenue expectations, shares failed to gain traction Wednesday, falling about 2.5%. 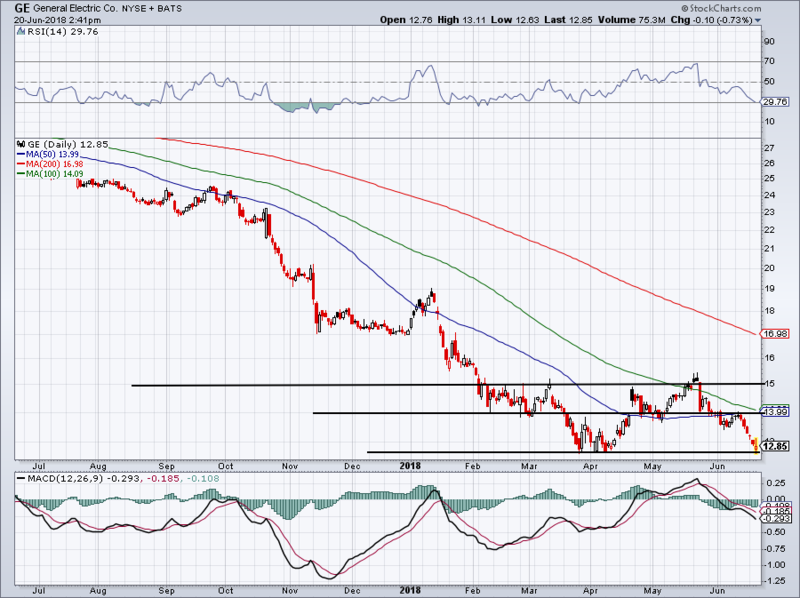 Although far from horrific, the drop put FDX below its $255 breakout level. That’s too bad, as this one was looking very promising. It’s now at the 50-day moving average and just above (or at, depending on how it’s drawn) trend-line support. If these levels fail, the trend and the breakout have failed. That may be okay for investors, but traders can find better setups in this market. 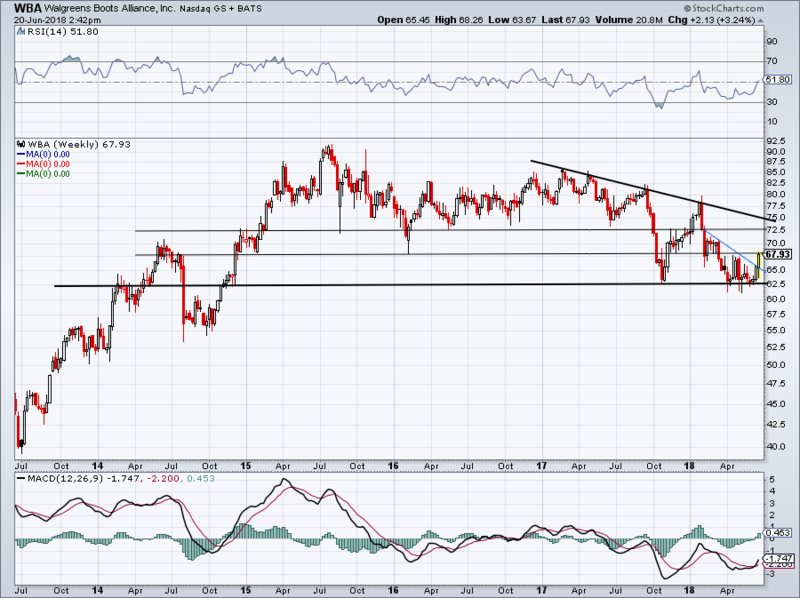 Better like, Facebook Inc (NASDAQ:FB)? The whole FANG group is churning out impressive gains and that includes the previously struggling social media company. 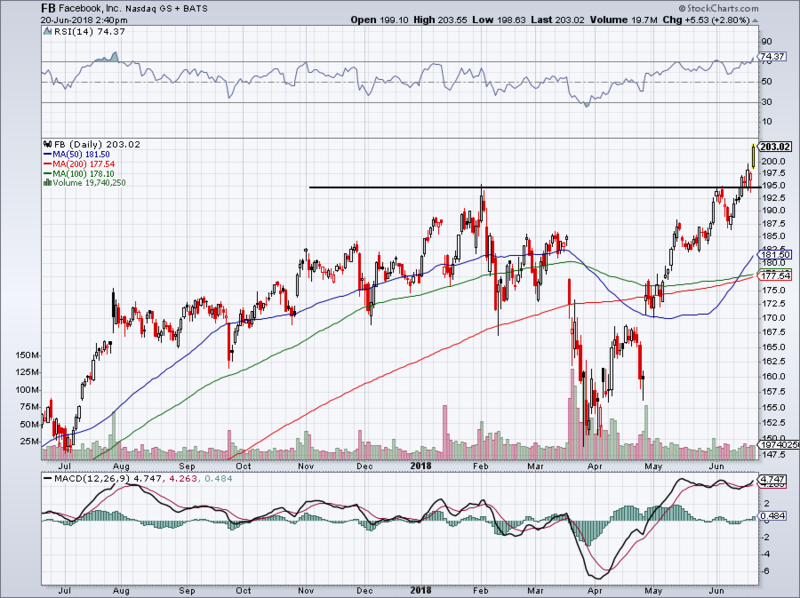 After toying with the $195 level, FB didn’t show much hesitation to breakout over $200 and hit new all-time highs. Hopefully investors bought near $150 while they could, because Facebook’s been in a fierce rally since. Shares are getting extended though, as is most of FANG. 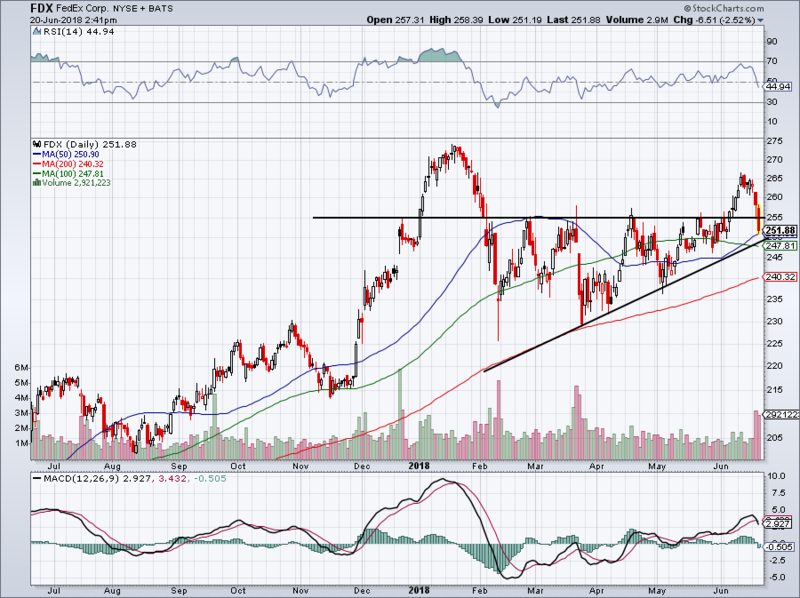 For Facebook, I’d love for a digestive pullback into the $192.50 to $195 area and see support hold. Then longs have a definitive risk/reward and a high-probability trade opportunity. Article printed from InvestorPlace Media, https://investorplace.com/2018/06/5-top-stock-trades-for-thursday-morning-fb-fdx-ge-sbux-wba/.